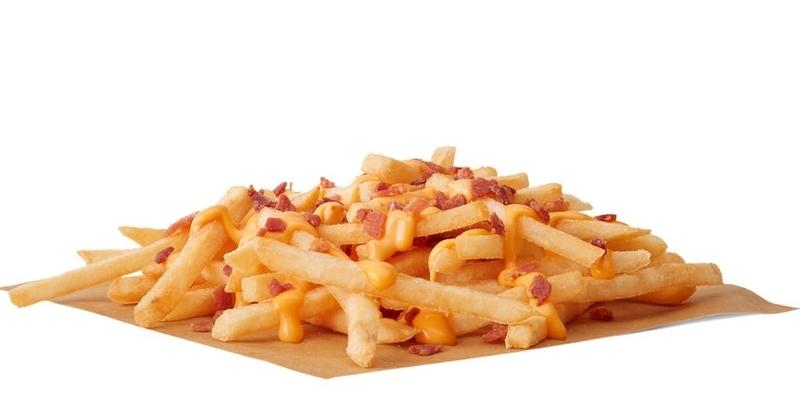 McDonald's locations in Mexico, China, and Australia have had a version of cheese and bacon-topped fries on their menu for a while. They definitely sound like an item the United States would swiftly gobble up, and the Golden Arches seem to be warming to the idea of a nationwide launch for these fries. Following a test market debut of a Cheesy Bacon Fries last year, McDonald's is now launching the loaded spuds regionally for a limited time. Areas getting treated to the fries include Northern California (as far south as Fresno), Hawaii, and Northern Nevada, including Lake Tahoe. Unlike the test from last year, which focused on a basket for two, these fries are available either a la carte or as an upgrade to an Extra Value Meal. The individual version is being sold at about $3.50-$3.75, according to Chew Boom. McDonald's has been doing a lot to get these Cheesy Bacon Fries to pop up in the news over the last year. In addition to the aforementioned launches, they were also available at the company's global headquarters in Chicago for a limited time. All of this publicity and availability for the item does suggest that we're getting a lot closer to a potential launch. Whether that happens in the near future or not, however, remains to be seen for now. For those in the areas where the Cheesy Bacon Fries are available, you have until the end of the year to try them out for yourselves.